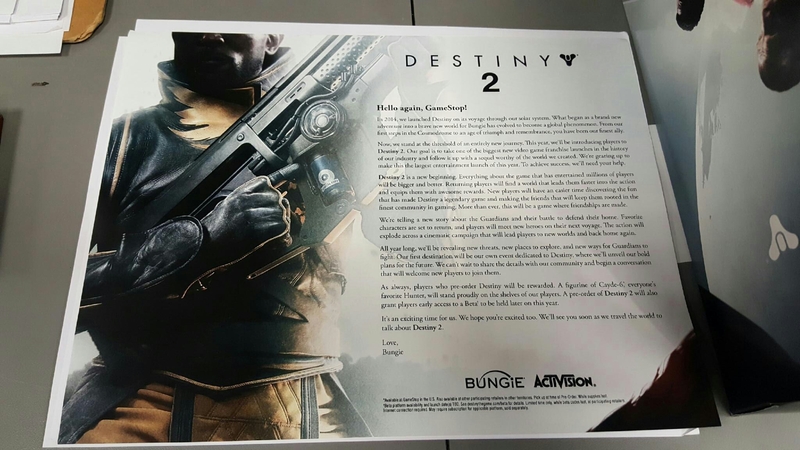 According to a leak by GameStop, some documents have been published that contains various details on the roadmap of the additional content of Destiny 2, title officially announced last week with a trailer. In 2014, we launched Destiny on its voyage through our solar system. What began was a brand new adventure into a brave new world for Bungie has evolved to become a global phenomenon. For our first steps in the Cosmodrome to an age of Triumph and remembrance, you have been our finest ally. Now, we stand at the threshold of an entirely new journey. This year, we’ll be introducing players to Destiny 2. Our goal is to take one of the biggest new video game franchise launches in the history of our industry and follow up it with a sequel worthy of the world we created. We’re gearing up to make this the largest entertainment launch of this year. To achieve success, well need your help. Destiny 2 is a new beginning. Everything about the game that has been entertained million of players will be bigger and better. Returning players will find a world that leads them faster into the actions and equips with new awesome rewards. New players will have an easier time discovering the fun that has made Destiny a legendary age and making the friends that will keep the rooted int the finest community in gaming. More than ever, this will be a game where friendships are made. We’re telling a new story about the Guardians and their battle to defend their home. Favorite characters are set to return, and players will meet new heroes on their next voyage. The action will explode across a cinematic campaign that will lead players to new worlds and back home again. All year long, we’ll be revealing new threats, new places to explore, and new ways for Guardians to fight. Our first destination will be our own event dedicated to Destiny, where we’ll unveil our bold plans for the future. We can’t wait to share the details with our community and begin a conversation that will welcome new players to join them. As always, players who pre-order Destiny will be rewarded. A figurine of Cayde-6, everyone’s favorite Hunter, will stand proudly on the shelves of our player. A pre-order of Destiny 2 will also grant players early access to a Beta* to be held later on this year. It’s an exciting time for us. We hope you’re excited too. We’ll see you soon as we travel the world to talk about Destiny 2. More details on additional content of Destiny 2 will be revealed in the coming months, the game will be released on September 8 on PlayStation 4, Xbox One and PC, in Standard, Limited and Collector’s Editions.